Completely different than the north polar area, Antarctica is the "Great Southern Land Mass" on planet Earth surrounding the South Pole. There is no land mass at the North Pole, just the Arctic Ocean with a (usually) permanently frozen center. Submarines have ventured all the way under the North Polar Ice Cap. 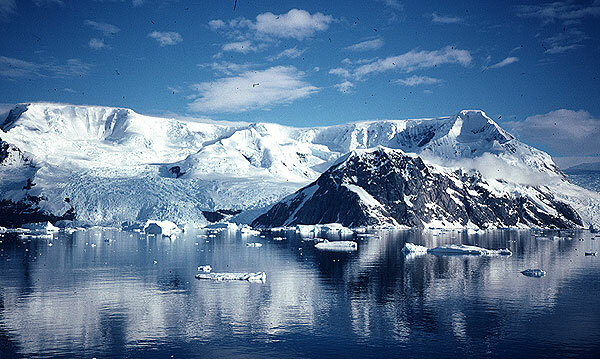 The immense land mass of Antarctica makes it the Seventh Continent - the highest, driest, and most uninhabited continent on Earth. It is as big as the United States and Mexico put together. In the winter you can add Canada to this as the sea ice develops - pushing its perimeter northward. The magic of Antarctica unfolds for the lucky visitor. During the Antarctic summer (December and January) of 2000/2001, I was one of those lucky visitors, making 12 landings along the Antarctic Peninsula and its surrounding islands. I remain in awe of the ice and the unique life forms that make this special place their home. Many thanks to Marine Expeditions and their fabulous naturalists (Sonja, Adam, Brian) along with their expedition leaders (Brook, Gary, and Craig) who taught me many things about the great southern ecosystem, provided the logistics so that I could experience and photograph this great land, and kept me safe on calm days and during rough blizzards. Thanks also to the folks at Mountain Travel Sobek (especially Joe Toback, and Julia and Kevin Richards) who expertly led our group. Kudos go to my husband, Shane, for being my best friend and expedition companion - it is so much fun to share nature's wonders with those close to you.